Retailers are refrigerating their entire beer inventory, with great results. Despite the higher costs, more retailers are refrigerating all their beers for maximum freshness. The Boise Consumer Co-Op (coolers pictured) even chills its back stock. When craft beer drinkers in Boise, Idaho, crave fresh IPAs, they often head to the Boise Consumer Co-Op. Matt Gelsthorpe, the Co-Op’s beer buyer, notes that the store is known for its strict adherence to beer-freshness standards. “Brewers and customers know we check the code dates on beer and always refrigerate our back stock,” Gelsthorpe says. Indeed, the Boise Co-Op—which offers about 500 beer SKUs at an average price of $8.49 a six-pack—is among a growing number of beer retailers so committed to maintaining quality that they chill all their beer stock whenever possible, including back-up inventory. “Beer quality is our primary concern,” Gelsthorpe says. “We have an educated customer base. When they see warm beer, they cringe.” For the past five years, the Co-Op has stored the majority of its back stock in a 400-square-foot walk-in cooler. In Hillsboro, Oregon, the hybrid pub and bottle shop ABV Public House emphasizes beer quality over quantity. Owner Kevin Stahr notes that while some bottle shops feature thousands of beers—with many stocked on warm store shelves—his store offers 800 brews, and all are properly refrigerated. ABV features 20 cooler doors with the temperature set below 50 degrees. Meanwhile, in Woodland Hills, California, Green Jug Fine Wine & Spirits has stored most of its beer in refrigerated space for more than eight years. “Customers appreciate that they aren’t confronted by a selection of warm IPAs,” says beer buyer Matt Newtson. 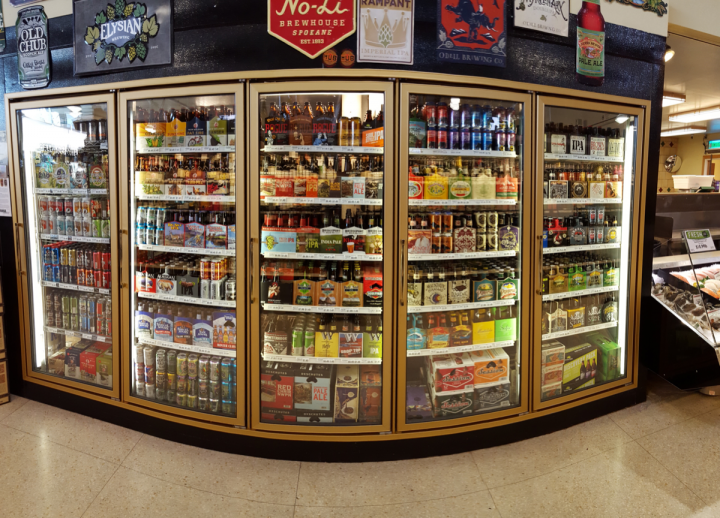 Green Jug has more than 1,000 beer SKUs, including domestic, imported and craft offerings. Craft beers retail from $8 to $20 a six-pack. Julia Herz, craft beer program director at the Brewers Association, cites Nielsen research showing that two-thirds of craft beer consumers say it’s important that craft beer is stored cold. “Any non-refrigerated beer will have a shorter shelf life,” Herz says, explaining that refrigeration fends off oxidation and the development of off flavors. Craft brewers are big supporters too. “Refrigerating beers straight through to consumer purchase can greatly extend their life span,” says Josh Breckel, field quality manager at Left Hand Brewing Co. He adds that refrigeration is particularly important with styles like IPAs that typically lose freshness more quickly. Left Hand’s Introvert Session IPA, for example, has just a 90-day shelf life with cold storage, Breckel explains. Other IPAs carry even shorter freshness windows. Breckel also points to the Catch-22 of beer displays. “We all know that big, beautiful displays sell beer,” he says, yet beer that sits too long at room temperature “can go bad quickly.” For this reason, Left Hand encourages retailers to rotate displayed beer after 30 days. Green Jug tries to limit its displays to styles like stouts that can withstand room temperature longer. Boise Co-Op, meanwhile, puts up beer displays for just a week. The industry is divided on whether consistent beer refrigeration will become widespread. Left Hand’s Breckel doesn’t expect a big surge in retailers opting to chill all beer, pointing to the expense of refrigeration. But Stahr of ABV reports that the practice is expanding in Oregon. “I expect it will become more common around the country,” he says.